At the outset of the Great Depression people distrusted banks but trusted paper currency and gold. They withdrew deposits from banks, which because of a fractional reserve system caused a drop in the money supply in spite of a rising monetary base. The Fed really had little power to control either bank reserves or interest rates. This figure also shows that the Federal Reserve has been significantly increasing the monetary base, which should, all else equal, put upward pressure on nominal spending. 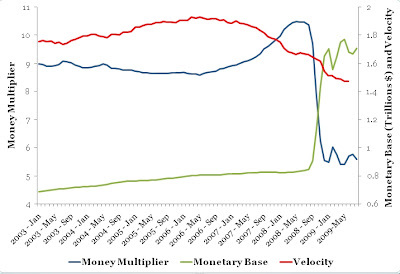 However, all else is not equal as the movements in the money multiplier and the monetary base appear to mostly offset each other. Therefore, it seems that on balance it has been the fall in velocity (i.e. the increase in real money demand) that has driven the collapse in nominal spending. Theoretically, as long as people are saving their money in banks rather than in coffee cans or mattresses, the banking system recycles the money and prevents your savings from becoming your doom. This greatly simplifies household economics, because the average individual is not well equipped to calculate the relative risks of, say, not having funds for car repairs and therefore not being able to get to work as compared to the risk that saving money for car repairs will contract velocity enough so that our average joe or jane will find himself laid off. Government guarantees on bank deposits plus high costs of incidental credit have sustained the flow of money into bank deposits currently, unlike the early phases of the Great Depression. Of course, when the banks are tightening consumer credit there is a much greater need to have money saved. When the flow of money from banks starts to be toward the Treasury and away from lending, money circulation is impaired unless the government is doing something that sustains the flow of money in the marketplace. Thus, the no-stimulus features of the stimulus bill have been a problem. Throwing a few hundred billion into infrastructure would have replaced the funds that are being effectively withdrawn by banks and sent to Treasury or put on deposit at the Fed. Alternatively, the Fed could just hand out money to consumers to extinguish high-margin debt and thus improve their incomes, or could offer low-rate loans to offset high rate loans. That would not have the multiplier of infrastructure spending. Consumers will tighten until they get their economic feet back, and the evidence is that they have not. Thus, although it is a gentler gradient than during the period of the Great Depression (Praise G_D and pass the ammunition), we have entered a similar dynamic and should feel an impetus to do something about it. We can't really do much about state and local taxation. It is going to have to be fought out municipality by municipality and state by state. States will have to cut spending since lenders are wary of financing state deficits, and the demographic problem of the upcoming retiree benefits is upon us. Oil: Oil as a refuge from monetary problems creates a separate economic dynamic, because both PPI and CPI are strongly related to the cost of oil. When oil goes up, they go up until a breaking point is reached and consumer spending on non-necessities is deeply impaired. When that occurs, trade cycles down and money flows are restricted in many channels, employment drops in some, diamonds deflate, etc. Of course, buying gold and storing it in your basement or buying oil and pumping it into storage or keeping it in a tanker temporarily removes money from circulation. It is not trade, but storage of money. When Chinese farmers are stockpiling copper, we can concede that monetary worries are not sequestered in the US and that the US alone will be unable to fight them, but we should do what we can. US incomes were dropping in 2008 and are surely dropping now. It is not just wages, but returns on investments and interest paid to households. I also have widespread indications of downward trends in rents, etc. Tight incomes combined with inflation are not going to induce a spending dynamic. Many authorities have encouraged the Chinese to try to boost domestic demand, but so far that doesn't seem to have happened in any structural way, although it is nice to know that Chinese families without electricity or running water have dutifully bought washing machines. Thank you, Mark.. There are many reasons for this. Chinese farmers and other rural workers were hit very hard by previous inflation in China, and so may be wary. The Chinese worker doesn't have much of a social safety network compared to most countries, so naturally they are pushed to save. They don't, for example, have effective hospital insurance. All of this leads us to the next aspect of the insurance/health care reform discussion. If insurance is failing, one would definitely expect a savings impetus to travel through the economy and consumer spending to retract. Insurance is really a means of efficiently saving in the aggregate for highly unpredictable individual expenses. It is economically efficient because the average cost is less than the 20% or 30% individual risk Say I have a 20% risk of racking up 600K in hospital bills over my working life. I reasonably have to save for something close to that, because throwing relatively large amounts of money into homes or businesses does not make sense if I may lose them due to the large medical bill. But if I have a 20% risk of 600K in hospital bills, that means that 80 out of 100 households won't have bills anywhere near that. So grouping the risk allows each household to save less individually and overall cover their aggregated risk more efficiently. This leaves the individual households able to spend more money on average on other things (which could include investments, business expansion, education) and boost the economy. I need to go into the question of efficient insurance in more detail, but I'm running a fever now and after I administer my medication it's going to go higher, so I think that will have to wait. But the bottom line is that insurance is not an efficient method of paying for highly predictable levels of expenses. Your predictable expenses will always be more efficiently covered by saving for them. When insurance is serving a dual purpose of welfare (redistribution of income from wealthier to less wealthy families who cannot save for predictable expenses) it is inefficient. This does not mean we shouldn't provide for the needs of poorer families, but redistributing income for welfare purposes should be done with direct welfare policies wherever possible. Having a certain amount of savings, even if those savings were generated for one specific purpose, will lower a household's total payments and therefore maximize that household's real income and economic options over time. Thus saving for predictable expenses is a fundamental feature of household economy, and diverting those savings into medical insurance is going to be a problem over time. Rebecca wrote a post some time ago speculating that some of the withdrawal of household equity over the last decade had occurred due to medical expenses. I would venture to guess that she is correct, because I would expect that very high medical insurance bills are stripping many households of the ability to save. I've got to find that post. My belief is that the US has created a situation in which private medical insurance is increasingly inefficient. This offers some hope of reforming the situation in ways which would support economic growth. Dr. Chu said he didn’t think average folks had the know-how or will to to change their behavior enough to reduce greenhouse-gas emissions. A couple of weeks ago I went to a supermarket in one of the richest 100 US counties. The store had introduced store brand flour, and 5 lb bags of it were sold out for $1.88. I think Chu greatly misunderstands the situation of the average American. "But the bottom line is that insurance is not an efficient method of paying for highly predictable levels of expenses." I'm reminded of that every time I'm offered an extended warranty on a product. It is far cheaper for me over the long haul to self insure it. I buy many products I could insure. A set percentage of them will fail before I'd like them too. However, I can't efficiently insure each and every item and expect to be better off. Failure is a rather predictable ongoing expense (when averaged out over many different items). Further, I'm also reminded many years ago of the sales pitch I was given when buying a portable CD player. I said I did not want the extended warranty. He pulled out a broken CD player and asked me if I'd be surprised that it would cost X amount to fix. I said I would be VERY surprised! He thought he'd just made an extended warranty sale. However, I continued. It should not cost X amount to fix. When the price of repair exceeds the price of the unit, any good repairman should simply replace the entire unit. That's something even I could do. Or how about credit card insurance? Good grief. You pay premiums and in the event you actually need the relief all it does is pay your minimum payment as the interest continues to accumulate. "The average rate of credit insurance is around 75 cents for each $100 of loan coverage per month." In my opinion, that money would be far better spent paying down the bill and/or setting it aside to self-insure. 75 cents per month per $100 is equivalent to a 9.4% interest rate (it compounds monthly). How can that possibly be helping the average person? Mark,be careful...the ability to do simple math and reason clearly are traits that are subversive to tha American way of life. Did you hear about the politician who promised that, if he was elected, he'd make certain that everybody would get above average health care? The old economic joke spoke of above average income, but I don't think the population as a whole finds that joke all that funny any longer. Tom - or at least subversive to Option ARM loans. Back in 2005 and 2006 when I was telling bankers that the inability of the average GA to figure percents meant that loans with initial payment discounts would fail in high numbers, people did not want to hear it. Hasn't Sears been sued and had to settle up multiple times for its various warranty and insurance schemes? Mark,would that be the politician who pointed at the University of Nebraska water tower during a commencement speech and claimed that the huge "N" on it stood for knowledge? or maybe that South Dakota Pol that told the Sioux they should go back where they came from if they did not like the way the government treated them? And MoM it is the Folsom Street Fair In SF this week where Morale improves when the flogging starts.I liked that town when it had a fishing fleet and industry,the freak show gets tiresome quickly. Yes,Sears had,and Publishers Clearing House (AMERICA"A RETIREMENT PLAN!!!) enters a new consent agreement with the FTC every year or three. MOM, thanks for linking that Laffer article. That, for me, explains perfectly the weird deflationary inflation thing we've got going. I'm going to read that ten or twelve times until I've internalized it. The key is this: deflation and inflation are only opposite and exclusive with a commodity-backed currency. Somewhere in the backs of their heads, economists seem to expect fiat currency to act like specie currency (and I sort of do, as well). But it doesn't, quite, particularly during times of severe economic stress. It doesn't serve the same function as a secure store of value. You have to rely on the government to maintain some portion of its value, and the reliability of our current government is in doubt, to put it mildly. Money that doesn't circulate (aka excess reserves in this case) doesn't matter. It especially doesn't matter when it is going to be destroyed (through loan losses at the banks) in the next 18-24 months. We'll be lucky if the banks only lose another trillion dollars in capital. Your discussion of insurance as a savings vehicle is dead on. Seems to me in that light insurance should be used just a catastrophic protection vehicle. Perhaps that's the best approach for health care. Would make people more willing to allocate scarce resources ($$) in an efficient manner. I have a dent in my car. Deductible is $2,500. Art Laffer is using selective history to support his politcal agenda and idiotic economic policies. First, I don't buy any claim that tariffs caused or worsened the Great Depression as imports were ~ 5% of GDP at the time as were exports. I'm supposed to believe that taxing a near zero net imports/exports balance led to a 37% drop in GDP? Idiocy. Moreover, President Coolidge had raised tariffs during his term without causing an immediate depression. As with the increased tariffs, Coolidge was very popular for cutting taxes during his tenure. So applying Laffer-like unproven cause and effect logic one could easily argue that the tax cuts led to the Great Depression. I'll add that income taxes were implemented in 1913 without causing a depression let alone a Great Depression. Again, idiocy. And why doesn't Laffer mention all the bad bank credit that was extended to buy inflated assets during the 1920s? Or the fact that CONsumer credit soared during the 1920s? Or all the attempts by TPTB to prevent the bad debts from being realized and written off? Depressions are caused by banks and improper use of credit. They're prolonged by politics. And all main stream eCONomists are beholden to a bank or a politician. We've abused credit in the last decade like never before. And our politics today resemble that of fascism. We'll be lucky with an an outcome like Japan. And here's a bonus head scratcher. How can any sane person view the Great Depression years as a worse period than the WW2 years? Yet, eCONomists hold that twisted view to this very day. What more do you need to know?!?! I'm sorry you're feeling poorly. Another point about insurance is that it is a fraction reserve system like banks. A run on the insurance company will bankrupt them. So we get sold insurance insurance. Even if the actuaries do their jobs perfectly and predict the future with 100% accuracy, the actuaries aren't the ones investing the reserves; if those investments go bad the god-like perfection of the actuaries won't save them. Talking about taxation and tariffs in Coolidge's time and prior is fraught with error. There were no income and sales taxes back then, most government revenues were property taxes and excise taxes/tariffs. The "cutting" of taxes usually meant shifting the revenue generation to a new scheme but there has never in history been an actual effort to reduce government revenue. Think of the Alternative Minimum Tax which was designed to target the 155 top income earners when it was enacted and now swallows up millions of earners from inflation alone. How can any sane person view the Great Depression years as a worse period than the WW2 years? Getting murdered for you country is apparently better than starving for your banker. Since your politicians and your bankers are one and the same, it's a distinction without a difference. The power of propaganda. Besides, the WW2 years are a subset of the Great Depression years.